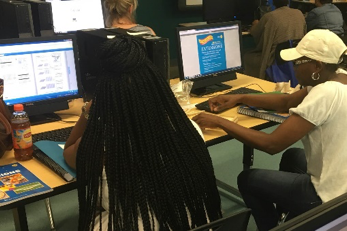 Summer is officially starting this week, but educators around the country have been hard at work during summer school helping their students bridge the gap during this crucial learning opportunity. 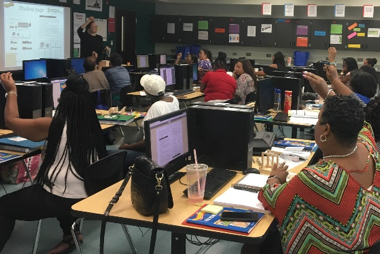 Our trainers have been all over the country working with teachers, principals and administrators implementing custom summer school curriculum to meet their goals. We have been impressed by the dedication of the education professionals who are determined to help their students and believe in the Moving with Math Learning System to improve learning and achievement. Over and over we heard administrators reminding teachers that summer school needs to be engaging and animated so that the environment is motivating. We worked with the teachers to help insure success by demonstrating our manipulative based lessons for those critical math concepts at each grade. All lessons use the Concrete-Representational-Abstract instruction method that help these struggling students truly understand the concepts so they can use it to build further knowledge. The teachers were enthusiastic and loved the scripted lesson plans that helped them maximize the use of the manipulatives. Many of the summer schools are using our web based assessment to maximize their teacher’s time, quickly pinpoint individual student weaknesses and develop a summer learning plan and then give them a roadmap for the fall. At a recent implementation workshop in Georgia, we were pleased that they found the system so easy to use and were excited by the detailed information it gave them as they developed their classroom plans. Most schools are also working on reading and loved that many of the lessons incorporate ties to literature. We shared some of our favorite stories like The Doorbell Rang and Apple Fractions and the many activities that they could do to tie math and reading together. Everyone left the workshops ready for the start of summer school armed with the tools to make it a success. If you like to learn more about our proven program or interested in receiving a list of those key math concepts by grade just email us at info@movingwithmath.com. Happy summer learning! 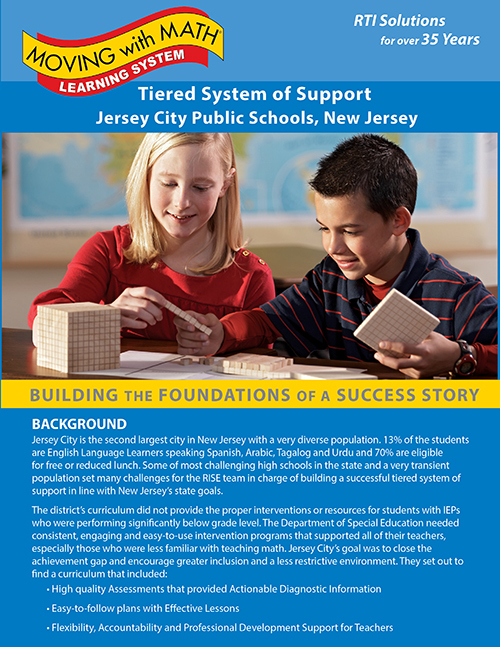 Speaking at the National Title 1 Conference in February, Sean Healy, District Lead Teacher for RISE in Jersey City Public Schools Special Education Department, reported that math achievement had increased 24% for students At or Above Grade Level on the ADAM during the 2015-16 school. He credits this improvement to careful planning and implementation of their tiered system of support and using the Moving with Math Foundations program as either a core or supplemental math program for their over 2600 special education students. Mr. Healy has been guiding his teachers and students on a path of success for the past five years. This large urban district with over 36 Title 1 schools has also shown improvement on state testing surpassing other districts with similar student populations on the PARCC assessment. The only other urban district who performed slightly better was Elizabeth, NJ and they also use the Moving with Math Learning System! When asked about his teacher’s favorite lessons he said “Most of the fraction lessons, especially at the younger grades, get rave reviews. Students being able to see what a fraction really is and compare different fractions with the models, both the circles and the bars, is very powerful.” These carefully designed manipulative activities are key to building student understanding of number sense, patterns and relationships, the critical concepts necessary to raise achievement. Mr. Healy noted that the Moving with Math Learning System was a “Perfect fit for New Jersey’s Multi-Tiered System of Support (MTSS) and matched well with the spirit and content of New Jersey’s new standards.” He noted that they were planning expanded use throughout the district and improved implementation with fidelity as future goals and looked forward to continued support and customization from the staff at Math Teachers Press. St. Paul Public Schools have used the Moving with Math Extensions program for the past three summers. In 2016 they used it district wide with over 12,000 students and achieved terrific results. 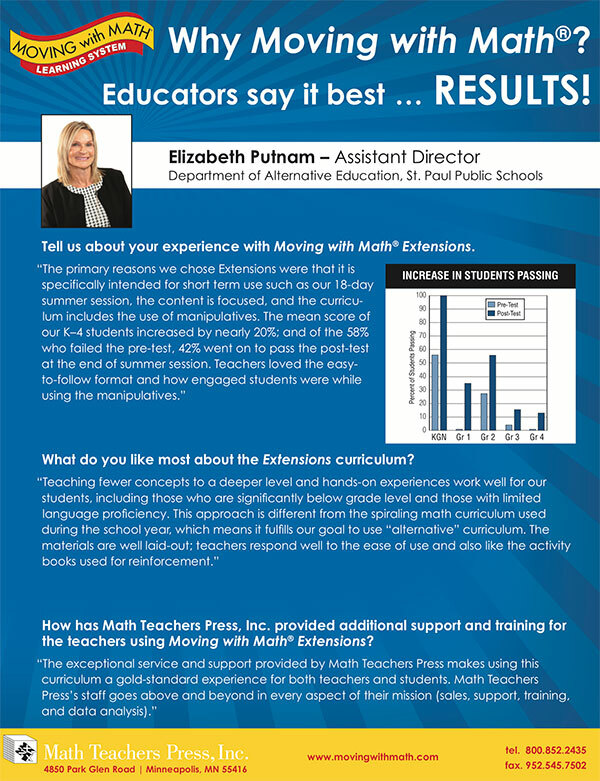 St. Paul Public Schools implemented the Moving with Math Foundations program in Fall 2013 as their RTI solution. Positive feedback from administrators and teachers, along with improved scores and increases in students’ conceptual understanding of math, led them to implement the Moving with Math EXTENSIONS program as their Summer Math solution. The easy-to-use Moving with Math Learning System, following the Concrete-Representational-Abstract (CRA) instructional model, is the ideal Summer School solution. Everything is organized in the customized pacing plans including the Assessment Tools for identifying students’ needs and monitoring their progress. Professional Development happens every day through the Scripted Lesson Plans assuring that all teachers communicate effectively. Students with a variety of learning styles and languages find that using concrete manipulatives helps them develop better understanding making them confident, successful learners. St. Paul administrators also commented that the professional customer service they receive is fantastic. Math Teachers Press provides support for the district and assists in everything from customized lesson plans, teacher training, organizing location material quantities and deliveries. Plans are underway for 2019 and St. Paul is anticipating another exciting summer of great results for their students! Afterschool Curriculum Choice: Mathematics Resources is an initiative of PEAR, the Program in Education, Afterschool and Resiliency at Harvard University and the SEDL National Center for Quality Afterschool. This Guide was conceived, compiled and coordinated by a team at PEAR in collaboration with SEDL to help practitioners locate and make informed choices about high-quality mathematics resources to enrich their programs. Moving with Math was included in the Guide with curriculum selected based on proven use in afterschool settings, and include challenging lesson plans and organized activities. NCSM’s National Conference in Boston had Monday’s lunch provided by Moving with Math® and heard Dr. Sonja Goerdt speak on supporting teachers in implementing the use of manipulatives in the classroom across all grade levels. 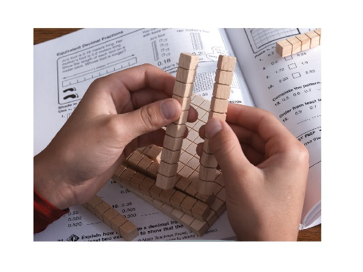 Using the NCSM’s position paper, Improving Student Achievement in Mathematics by Using Manipulatives with Classroom Instruction, she took a hands-on approach to sharing practical ideas on the use of manipulatives to develop critical math concepts.